15μm diameter OLED dots were arrayed with 20μm pitch by patterning deposited small molecule organic semiconductor materials with the new photoresist technology. It was confirmed that each dot emitted uniform light. FUJIFILM Corporation and imec have developed a new photoresist technology for organic semiconductors that enables the realization of submicron patterns. Due to their lightness, flexibility, and the possibility to manufacture them in large area, research and development on organic semiconductors has intensified in recent years. Organic semiconductors can be used in various applications such as organic solar cells, flexible displays, organic photodetectors and various other types of sensors. Current methods for patterning organic semiconductors include shadow masking and inkjet printing. However, these patterning methods are not suitable for high-resolution patterning on large-size substrates. Patterning based on photolithography6 would solve this issue. But photolithography is currently mainly adopted for patterning of silicon semiconductors. When applying it to organic semiconductors using standard photoresists, the photoresist dissolves the organic semiconductor material during processing. Fujifilm and imec have developed a new photoresist technology that enables submicron patterning on large-size substrates without damaging the organic semiconductor materials. The new photoresist technology was developed by fusing the semiconductor processing technology of Fujifilm and imec, with Fujifilm's synthetic-organic chemistry material design technology. Since existing i-line photolithography equipment can be used, and investment for new equipment is unnecessary, the new technology contributes to a cost-effective production of high-resolution organic semiconductor devices. 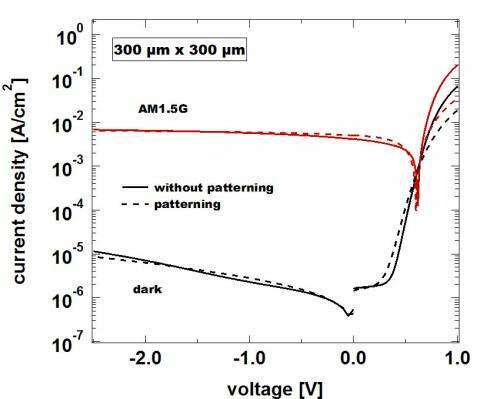 Organic semiconductor materials were patterned to form OPD of 300×300μm size, and photoelectric conversion property with irradiation of artificial sunlight (AM1.5G) (red dotted line) was examined. When compared with photoelectric conversion property without patterning organic semiconductor materials (red solid line), it did not show degradation due to patterning. Similarly, there was no difference between with patterning (black dotted line) and without patterning (black solid line) for unirradiated dark current. For technical verification, Fujifilm and imec developed organic photo detectors (OPD) and organic light-emitting diodes (OLED) using the new photolithography technology, and tested their performance. Organic semiconductor materials were patterned to produce OPD composed of fine light receiving elements down to 200?m×200?m size. Generally, patterning of organic semiconductor materials degrades the property of converting light into electricity (photoelectric conversion property), but the OPD developed in this case were patterned without degradation. 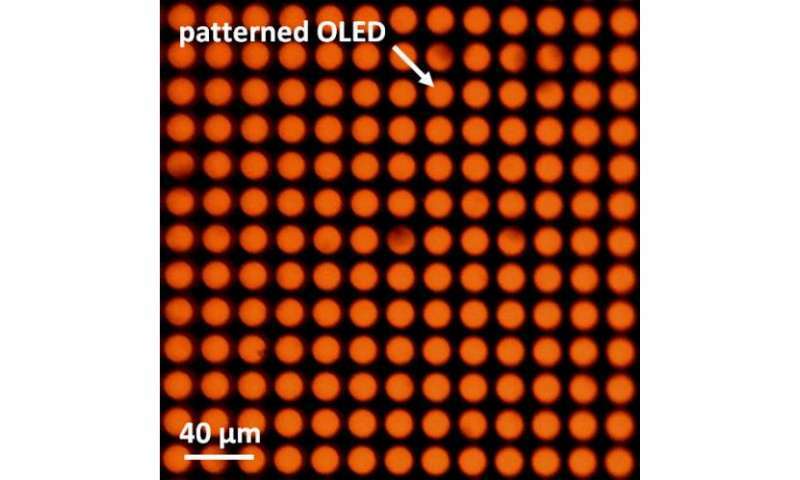 With respect to the OLED arrays that were produced using the newly developed photolithography pattering method: 20?m pitch OLEDs emitting uniform light, were realized. Fujifilm and imec will continue to contribute to industrialization of organic electronics by advancing research and development of semiconductor materials, processing technology and system integration.